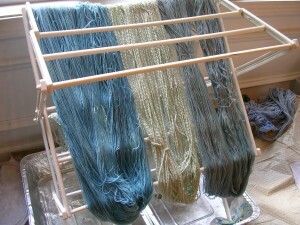 I love it when I get to post about dyeing. The pictures are always so colorful! 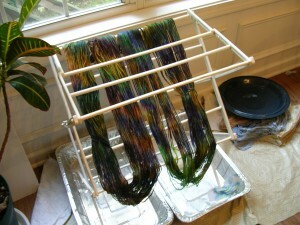 As I hinted earlier, I did some regular acid dyes while getting the indigo pot ready. The plan was to handpaint the lace weight single in emerald, purple, gold, and blue. Ha ha. My first mistake was not premixing the colors. I made a yellow, a blue, and a red, thinking I would just paint over the top of each one to create the nice green and purple tones. Believe me, that didn’t work so well. 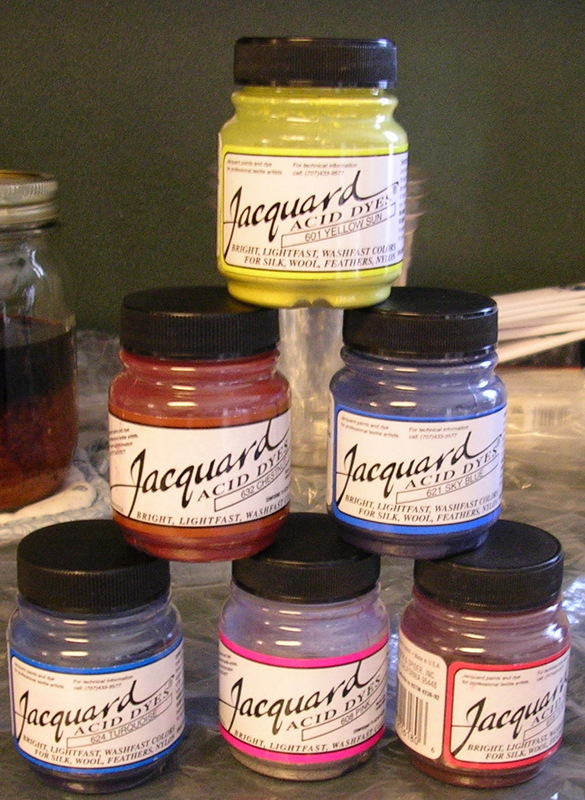 Especially since I diluted the colors so much it took three or four dabs to make a decent intensity of tone. In short, after messing about with it for awhile, I mixed up the colors I wanted and poured them over yarn in my usual method. Here is the result. And if anyone can explain to me how pink mixed with lots of sapphire can turn into burgundy, I’d be most obliged. It’s the weirdest thing I’ve ever seen. It went into the pot purple and came out this red. I’m still not even sure if I like the finished color mix. It definitely has character. In fact, it reminds me of some sort of exotic bird. The greens and the red. Well, now I just have to decide if I’m going to use this for a headband after all. I’ve railed at myself to stop trying to do multiple dye colors in one day. I’ve threatened, groaned, said I had learned my lesson, and so on. It hasn’t done much good. I did four colorways in one day. However, I did them in two sets of two, so it wasn’t so bad. These are all fibers that will be going up on the Etsy store. Not one, but two fiber-related boxes came today! 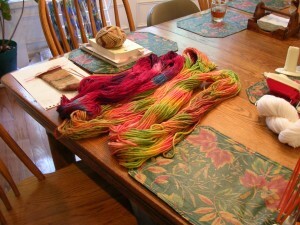 One from Paradise Fibers, the other from Earth Guild. I’m set on fiber for the rest of . . . the winter? A wonderful big box arrived! My aunt and I got a ball winder and six new colors of dyes! I’m so excited. 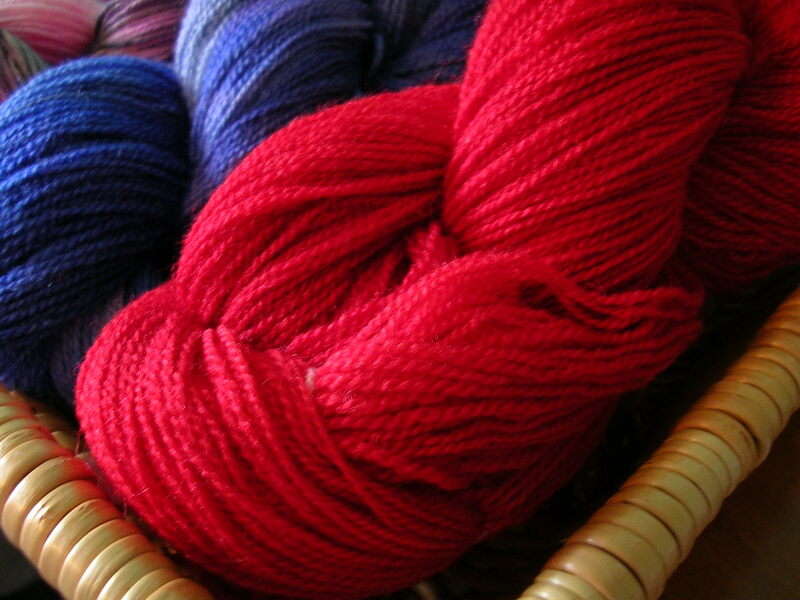 I can hardly wait to start winding dye balls . . . no. Dyeing wind balls . . . Oh! 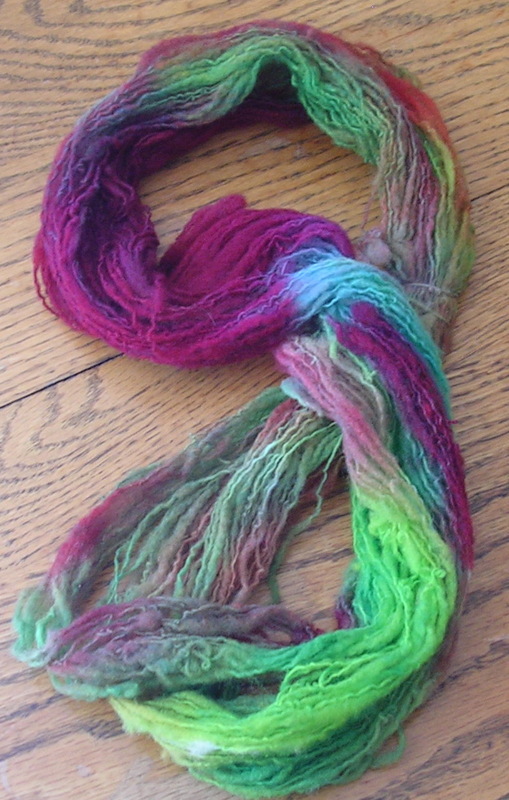 Balling wound dyes. Aaah! We tried the ball winder out on some store-bought yarn. It worked beautifully. We got it rather inexpensively at Knitting-Warehouse. I wasn’t expecting them to ship here very quickly, but they got it to me in just a few days. There’s an umbrella swift (to hold the yarn skeins) and some blank yarn and fiber coming from another store. At least I think it’s coming. I haven’t heard anything back from them about a tracking number. Hmm. I’d better go check on that.